AW-Energy offers advisory services for its customers on wave energy. 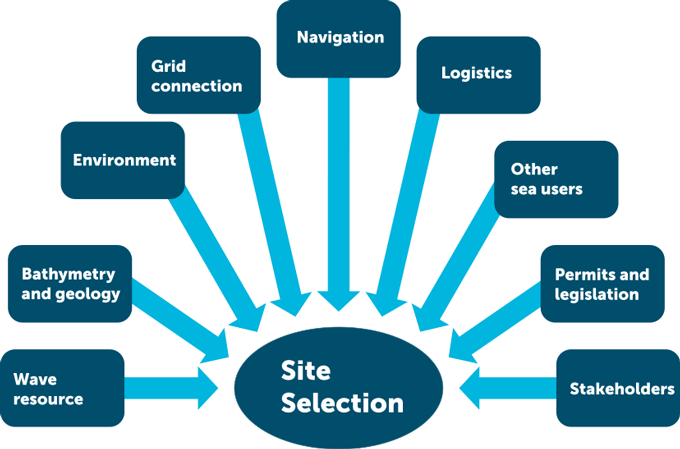 Our advisory services range from national energy strategy advice to identifying and studying single sites for WaveRoller installation potential. When trying to find out the country’s total potential for wave energy as a part of the complete energy mix, AW-Energy can do a quick study of the whole shoreline. This way, the authorities can get a total view on the possibilities of their energy production and what wave energy could bring into the mix. When there already is a desire to include wave energy into an area’s energy production, a site study can be used to find out the most suitable locations for WaveRoller projects. A quick study can be made first to find out in a short period of time how much electricity a WaveRoller farm could generate in a certain location or area. A more detailed site study is used to identify suitable locations for WaveRoller farms within a selected area. Regardless of the geographical area of the study, we can always take all of the related variables into consideration, includin the wave capacity, the potential provided by the nation’s energy grid, population density, current electricity price in each area, land usage, other energy production, etc. Provides important decision-making material in a short period of time, enabling the project to advance in steps with no heavy up-front investment. Identifies possible risks and obstacles already at the start. The final report serves later funding purposes and brings credibility to the project. The country’s whole wave energy potential can be confirmed relative to the energy need. The availability of the WaveRoller wave farms is high due to the robust technology and long and highly predictable maintenance cycles. Availability and reliability have been the guiding principles in WaveRoller design, and its preventive maintenance program is based on the same extensive RAMS (Reliability, Availability, Maintainability and Safety) methodology used for nuclear power plants and offshore wind technology. AW-Energy can provide extensive maintenance services for all WaveRoller wave farms through its global partner network. Tested and verified spare parts and consumables provided by AW-Energy ensure the correct operation and reliability of the WaveRoller. AW-Energy is offering 24/7 monitoring for the WaveRoller farms from AW-Energy service center. For customers, this enables light and efficient operation of the WaveRoller wave farms. The monitoring covers everything from the detailed production values to component wear and maintenance requirements. If our service professionals observe a change in the wear of a component that could cause unplanned downtime, a corrective maintenance action can be planned well beforehand to take advantage of suitable operational conditions. Depending on the agreed service level, 24/7 monitoring and service makes quick response to unexpected events possible even without customer input and helps to minimize the need and costs of unplanned maintenance. WaveRoller is a highly scalable technology, and the number of devices in a wave farm can be easily increased during the farm’s lifecycle. The WaveRoller farm production can be optimized based on accumulated environmental and operational data and to make the most of possible farm expansions.